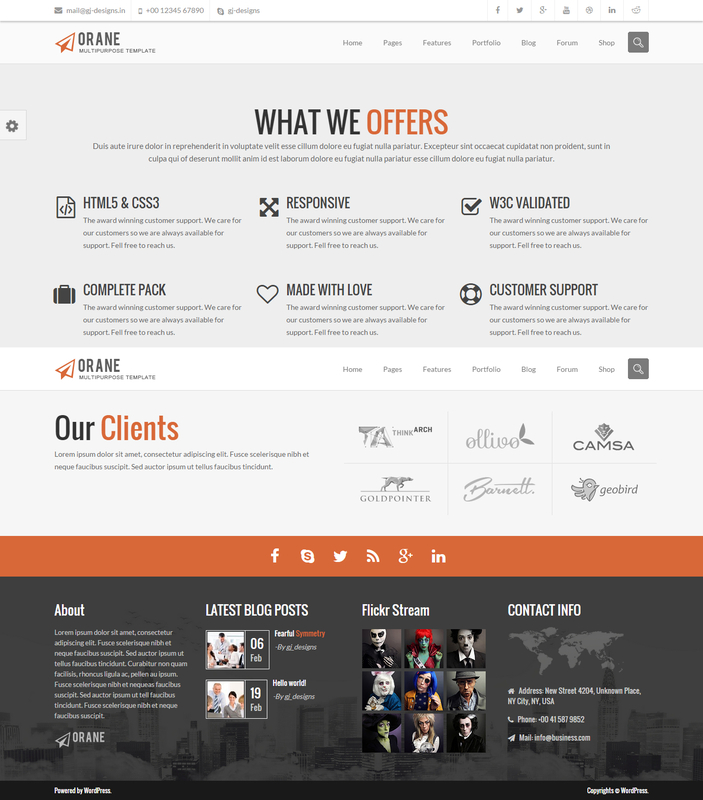 Extremely powerful and easy to use admin area that allows you to customize every single section of the theme. 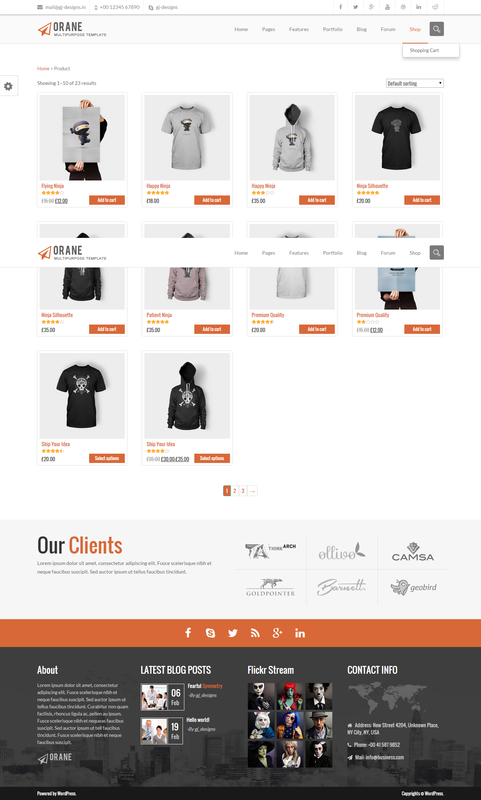 The admin panel allows you to customize theme logo, favicon, colors, mouse hover styles, different sections of the theme, social components, and even woocommerce. 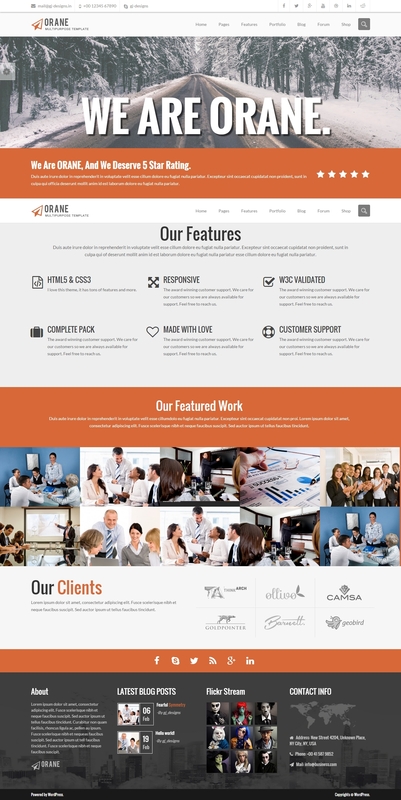 You can use Orane as your online shop with just a few clicks. 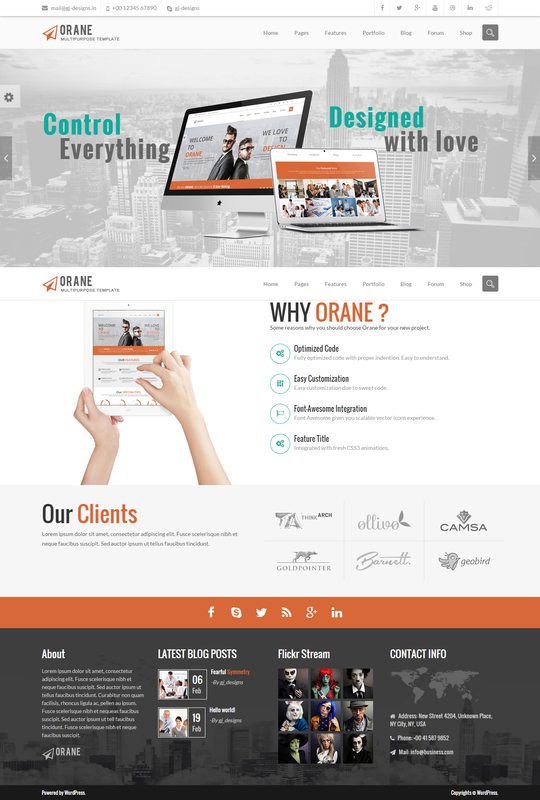 Orane comes with in-built woocommerce styling specifically made for Orane and allows to customize every single element of your woocommerce shop. You can use Orane in any language, Orane adds support for both WPML (commercial) and qTranslate (free). Orane is search engine optimized and supports all popular SEO plugins including YOAST and All in one SEO. Slider Revolution allows you to build amazing image and video sliders. Drag and Drop interface makes it easier to make sliders in a few clicks. Orane comes bundles with a few dummy sliders. Support for form plugins including quick ‘contact page builder’ with Contact Form 7 (or any other form) will help you make contact pages in seconds. You can make your projects portfolios with just a few clicks. 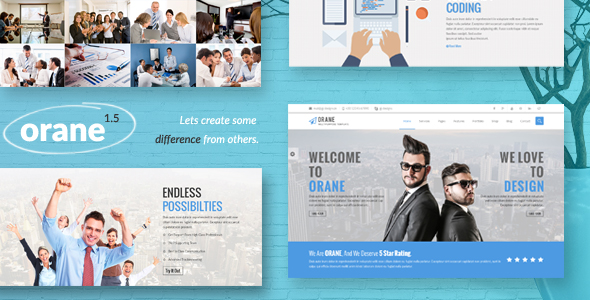 Orane include portfolio template for pages, and a visual composer portfolio component will let you make portfolio elements in seconds. 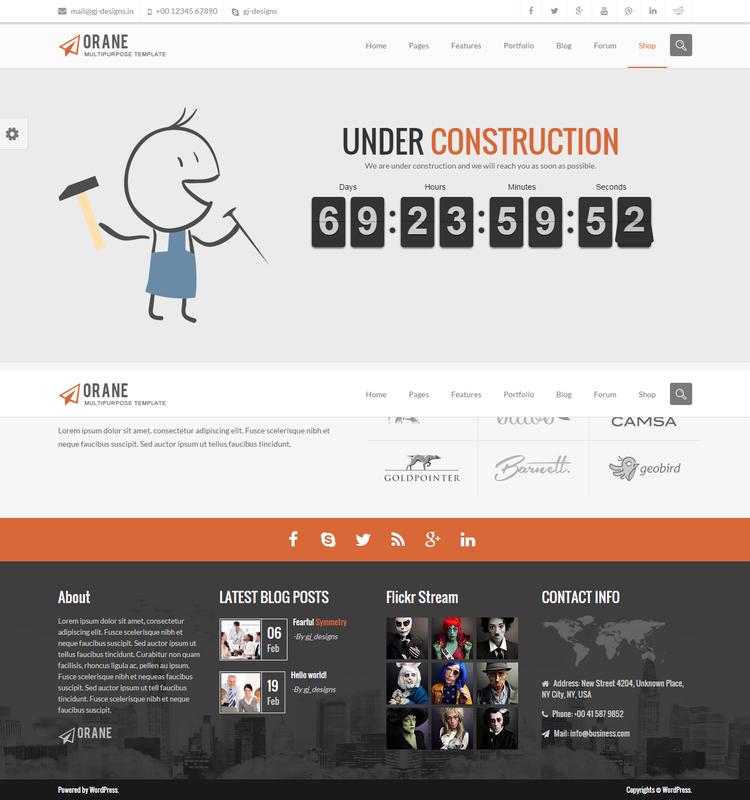 Create an ‘under-construction’ page by just drag & drop in Visual Composer. The custom visual composer component lets you choose a starting time to show the users with are going live with an animated flip clock. Easily add discussion forums to your Orane site. 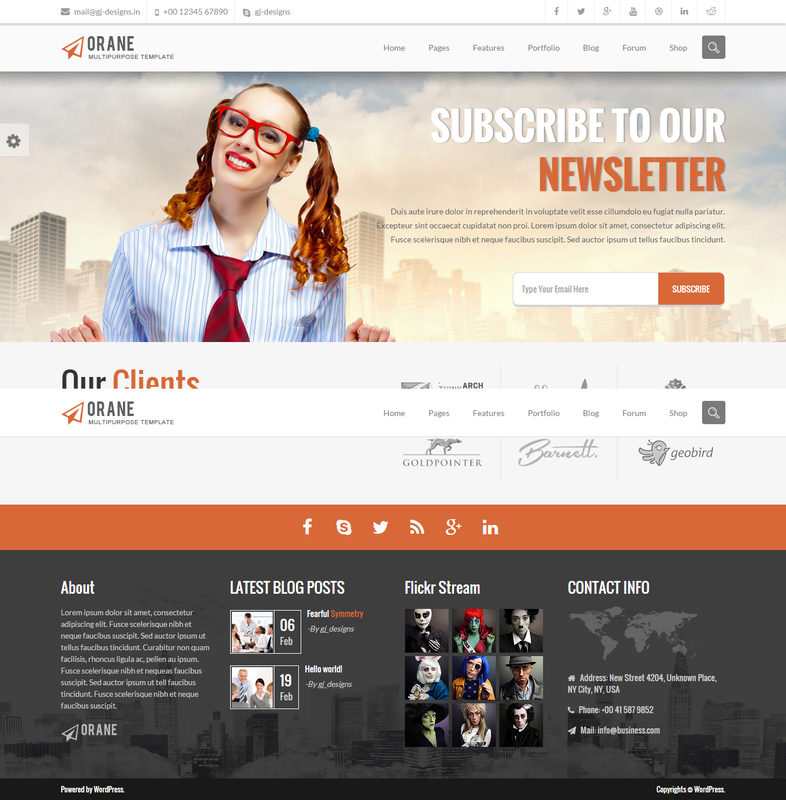 Easily make your Orane theme into a Social Network Site with BuddyPress. BuddyPress helps you run any kind of social network on your WordPress, with member profiles, activity streams, user groups, messaging, and more. Make a beautiful 3D testimonials slider in a few clicks to show everyone how much your clients love your services. Do you have a Flikr gallery? Just add the widget and show it to everyone. Regular WordPress posts can be displayed as portfolios, image, quote and much more using easy to use options in each post. 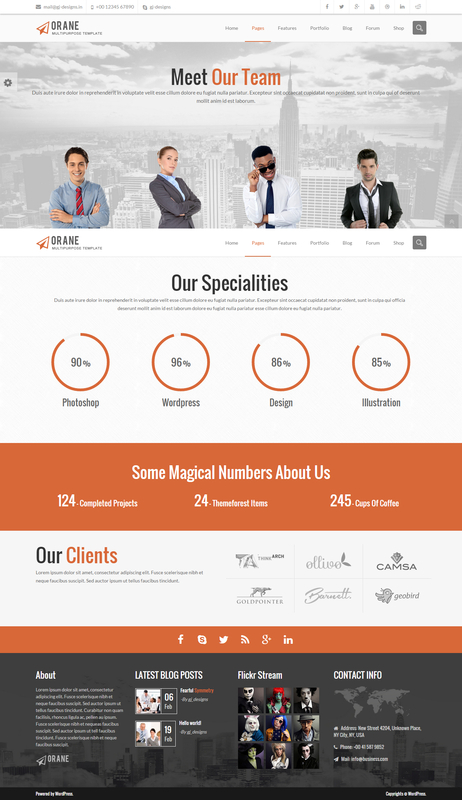 Our staff will help you setup your site and guide you in customizations. 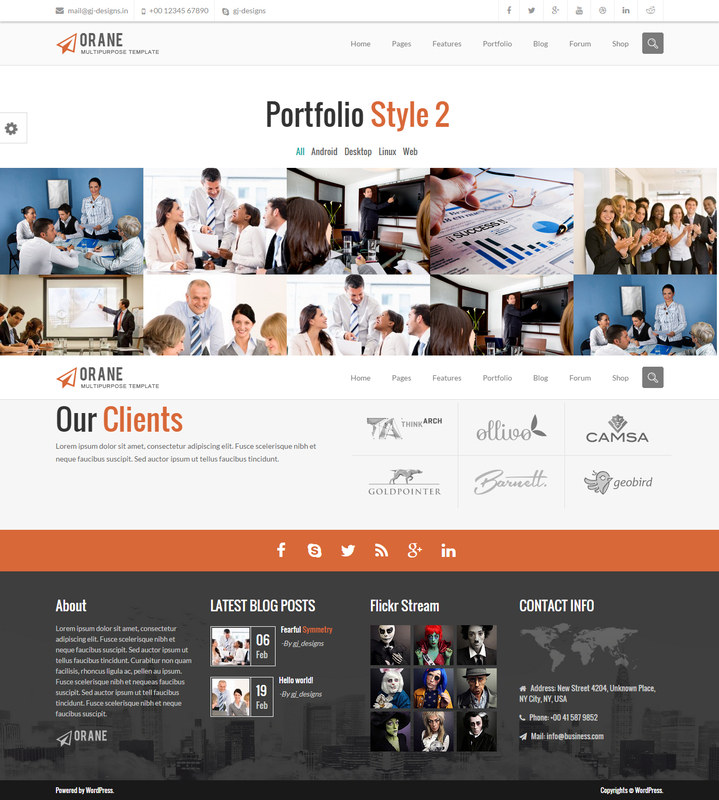 Orane also comes with extensive documentations and video guides that will help you set up your theme in a few clicks. Need help setting up? 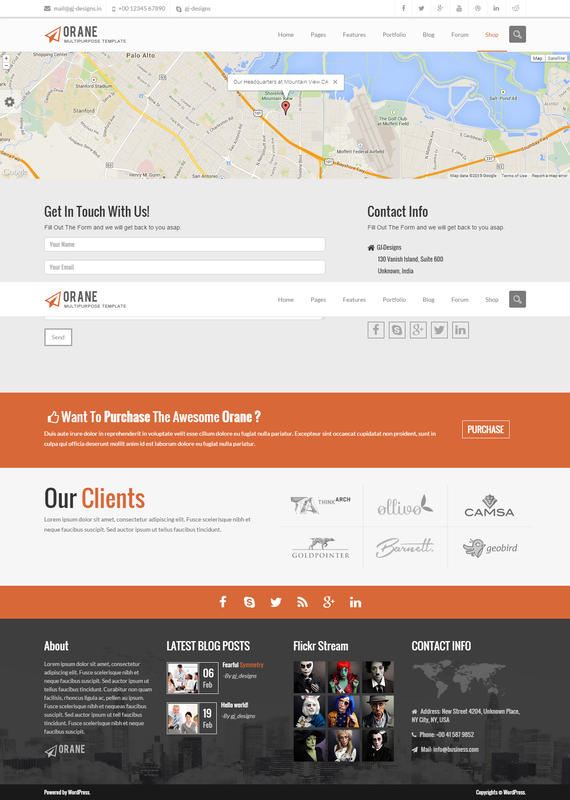 Whats better than video tutorials to set up your Orane website. The video setup guides will help you each step at a time. Orane support addons using its own addons through updates or installing them manually just like a regular plugin. Orane updates regularly with more features. The theme and the core plugin both updates regularly and independently of each other so you can get more features and Visual Composer addons through plugin updates and Theme styles through theme updates. Version 1.5 (27 Nov 2015): Allows all Visual Composer elements to have parallax background and youtube video background. Updated Visual Composer and Revolution Slider. A few Fixes. Version 1.3.0 (10th October 2015): Added container/full-width switcher in Visual Composer row elements. A few updates. Minor bug fixes. Version 1.2.8 (5th June 2015): Added One click demo import. Added Pinterest in the social sections. Better Visual Composer integration. Minor bug fixes. Version 1.1.0 (Auto-Update 11th April 2015): More Flexible Clients Section. Added Instagram in the Social Section. Customizable Footer Background Image. Multiple Submenu bug in Mobile Version Fixed. Contact Page textarea Height Increased. Version 1.0.4 (Auto-Update 7th April 2015): Added more fonts customizations. Made features into links (Orane Core Plugin). A few bug fixes. More WordPress Customizer Options.